In years past musicals like “Singing in the Rain”, “Starting Here, Starting Now” and the “King and I” brought exhilaration and a full house to Lakeland’s Harrison School for the Arts theatre. This year, despite the ongoing construction at the school, the show must go on and you will be astonished by the exceptional talents these High School kids from departments such as musical theater, music, dance, orchestra and theater departments, showcase. 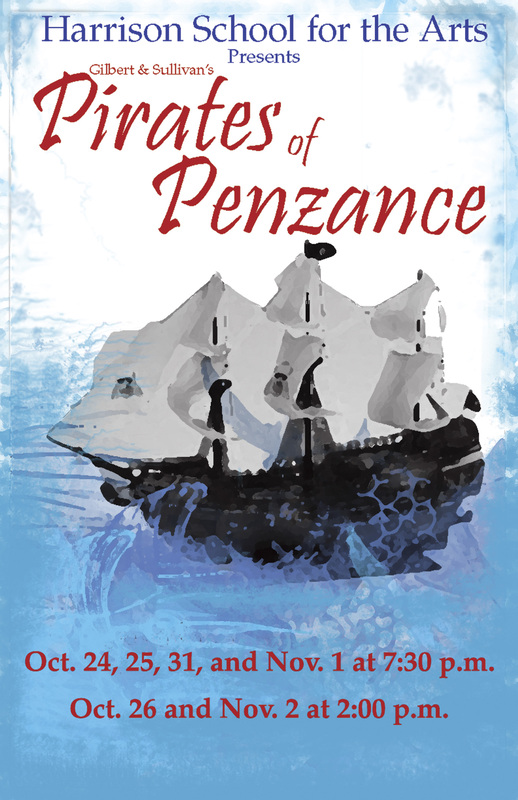 For the next two weeks, students from the Lois Cowles Harrison Center for the Visual and Performing Arts will present this fanatical rendition of “The Pirates of Penzance” by W.S. Gilbert and Arthur Sullivan. The raucous operatic tale of a young pirate apprentice named Frederic who decided to leave the pirate life forever. Feeling obliged, however, to point out the pirates’ weakness being too softhearted. Apparently, all a captive must do is claiming to be an orphan and he is immediately released. Frederic, who has never seen any woman other than his partially deaf nurse, Ruth, stumbles upon a group of beautiful maidens and immediately falls in love with the Major General Stanley’s daughter Mabel. Soon thereafter, the pirates arrive and want to marry the rest of the Major General’s daughters. While the Major General Stanley recruits help from the police to stop the pirates, Frederic offers to help Stanley and the police to protect the ladies but soon realizes being torn by his slavery to duty under the swashbuckling Pirate King. The show will be presented in the spirit of satire that Gilbert and Sullivan were known for, while at the same time, giving a contemporary audience an opportunity to enjoy the wit and style of slapstick and tongue and cheek hilarity. This production of Pirates leaps into the audience’s seats as a boisterous romp full of high spirit with sword fights and hilarity that makes an evening at the theatre enjoyable. Box Office hours: October 21st through October 23rd & October 27th through October 30th – 3:00 p.m.-6:00 p.m.
October 24th & October 31st 3:00 p.m. – 8:00 p.m.
October 25th & November 1st 4:00 p.m. – 8:00 p.m.
October 26th & November 2nd 12:00 p.m. – 2:30 p.m. Prior to the opening night of Pirates of Penzance, the Visual Arts Department will hold their Visual Arts Reception themed, “Stars, Stripes and Polka Dots” on October 24, 2008 at 6:00 p.m.